The terrain here has become much more open in a way that I didn’t expect. There are big dramatic fields with sharp yellows and green, deep blue skies overhead with picture-perfect clouds rolling through them. The wind comes and goes suddenly. Sometimes inadvertently, I flush out a flock of grouse or wild turkeys or other similarly loud bird and I like the way it keeps me alert. It is exhilarating, all of it. In keeping with my alter ego, I have chanted a cadence to pass the time: “Left, Left, Left her at home, hope I Left her Right and Left, Left…” It just surfaced from the depths of my memory, un-summoned. I’m pretty sure I learned it at 6th Grade Camp some 17 years ago. It makes me think: Lance used to joke that he would make a terrible soldier and I have to agree. Through our entire relationship we never fought, and in the only true battle we had together, he bailed. He didn’t fight it out, he pushed the red button without ever having to get his hands dirty. He is as a coward, unwilling or unable to work for our marriage when things got rough. He wouldn’t even wait for me to figure it out, let alone do anything! I am getting closer to being done mourning for Lance but I still feel a tinge of anger toward him, which tells me I’m not quite there yet. Our relationship worked for so long because I made it work, and as soon as I stopped taking that burden all on myself, as soon as I asked him to come to me, it was over. When I think about my relationship with Lance, I never doubt that he loved me, but I absolutely doubt that he ever understood me. He found me amusing, interesting, cute, but he didn’t get the substance of who I am. What good is love if it it’s based on a false representation of who I am? The things I like most about myself, that I feel are most love-worthy, are things that he wasn’t really able to perceive. It’s not his fault. I can’t blame him for it any more than I could blame a color-blind person for not being able to see a certain hue of blue. But that doesn’t mean that I don’t desperately want my partner to be able to recognize in me the things I value most. Through years in my relationship with Lance I developed an emotional reflex where I would feel ashamed of my behavior as soon as we left a social situation I always felt like Lance thought I was too loud or too enthusiastic or too everything. When I was at my most myself, I embarrassed him. I recognize that it goes the other way too: if Lance didn’t appreciate who I am because we are different types of people, then I’m sure there were things I didn’t appreciate about him as well. He deserves to be with someone who values what he has to offer. In any relationship, it’s impossible not to take each other for granted after awhile, but it goes deeper with us, we wanted to but just couldn’t see each other’s deepest colors. When mosquitos court, they synchronize the frequency of their wing-beats so that they can mate mid-flight. This is their form of compatibility- they can’t reproduce if they can’t calibrate to each other. I think that was the problem with Lance and I. It wasn’t for lack of trying, but we were just out of tune. 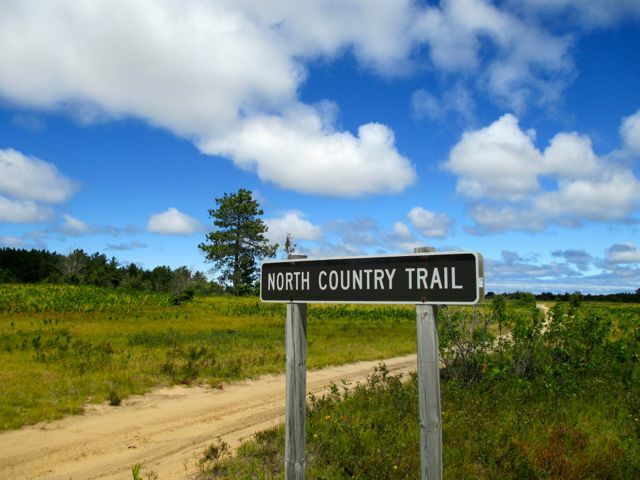 This entry was posted in Left of East, Relationships and tagged divorce, michigan, north country trail, Upper Peninsula. Bookmark the permalink. beautiful writing. love the mosquito metaphor.